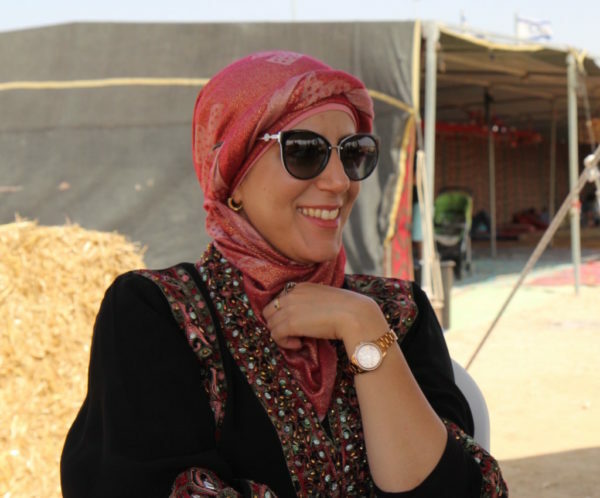 Lina Alatawna, a young, Bedouin woman, has been appointed Director General of Project Wadi Attir, sending shockwaves through the Bedouin community, and setting a powerful example of female leadership and achievement. The decision was made unanimously by a special selection committee after a public solicitation for applications, as well as profile testing by an independent agency and an interview process. Before her appointment, Lina had already been working at the project for two years as the Director of Operations and Resource Development. Lina was educated as a chemical engineer and holds a Master of Science degree in Industrial Engineering and Management from the Shamoon College of Engineering. Please enjoy this short interview with Lina, below. Tell us about what drew you into the project. What were your initial impressions? Lina: I came to the Wadi Atir project about two years ago after I finished my academic studies and started looking for work. I sent my resume to the project, which invited me to an interview. I was very surprised when I arrived at a project that was only five minutes away from my home and yet I knew nothing about it before. I found it to be a very special place with special people, and was attracted to the basis of The Lab’s five sustainability principles, the combination of Bedouin tradition, technology and sustainability, and the bringing together of different populations. I personally feel very much connected to everything and day to day all my love for the place and for the people just grows and strengthens. Tell us a little bit about yourself and your family. What do you bring to the project from your community, your family, your education, your values? Lina: I have two brothers: one is older than me (married with twins and working at Brom Chemicals in Israel), and the other is younger (a third year college student in management). My parents are teachers: my father is a physical education teacher and my mother is a mathematician. My mother is originally from the Meshulash and not a Bedouin, so I feel that I am the product of two traditions. The fact that I am a Bedouin and raised in a Bedouin village means I live with the people and I understand their mentality, I speak their language and I’m sensitive to them. This understanding of the Bedouin mentality is, in my eyes, the most important added value I bring to the project. In my field of study, I have also integrated two worlds: chemical engineering (with a specialization in process engineering) and industrial engineering and management, both of which contribute to the way I work in various areas of the project, both directly and indirectly. Personally, I think that all these things have combined to shape my character, giving me the ability to connect and understand others, while also helping me develop within the staff a common language, and a culture of empowerment and cooperation. What do you see as the project’s strengths? What are you hoping to build on as a the new General Director? Lina: The project is very special and attractive, the ideas it brings and its vision are new things that no one thought before, giving people the opportunity to develop, grow, realize, work, and connect with people from different worlds. And today, I can say that everyone who works in the project and has a connection to it are all very special people. In my view, the most important challenge is how to be successful in combining the five principles at all levels and in all decisions. Where would you like to see the project in 5 years? Lina: I want to see the project achieve all its goals and live up to its vision: achieving economic independence, strengthening ties with the community, strengthening the commitment of the employees as well as their sense of ownership over the project, offering authentic premium products in all departments, raising the fertility of the land, integrate various studies, etc. You can read more about Lina’s appointment in a recent article in JNS about Bedouin women in leadership.